I am not that kind of mom. Two years ago, I participated in a Spring Break Swap with a group of close friends, where we each took turns at our respective houses watching nine kids for a day. My kids have lovely friends. Kind, intelligent, creative friends. But that did little to quell the feeling that I was UNDER SIEGE. So many little mouths telling me they were hungry! So many eager eyes imploring me to admire their drawings! So many children running up and down stairs, squealing and shouting and scrabbling! Nope, I am not that kind of mom. It turns out that becoming a parent didn’t transform my Type A personality. I’m often still as inflexible as my daughter is when she’s presiding over her tea parties. Still, the idea of having an open-door policy, of creating a space where everyone feels welcomed and accepted, holds great romantic appeal. On paper. This promise of hospitality is just one of the many reasons that I continue to be taken with Ben Hatke’s 2014 picture book, Julia’s House for Lost Creatures (Ages 3-6). The only reason I didn’t write sooner about one of my favorite books of last year is that it was initially such a runaway hit, the Indie publisher couldn’t print them fast enough! But WAIT. My children would go absolutely bananas if I wrote another word without mentioning their favorite detail: that the book opens with Julia’s life-sized house arriving at the seaside on the back of a turtle. That’s right, some people go where the wind blows them; others follow the whim of a giant, purposeful turtle. There is the predictably unpredictable chaos that ensues when all the creatures suddenly find themselves under one roof—and the effect that this has on poor Julia, who would really like to be a lot breezier than she is. Even if she can get past the mountain of dirty dishes, the footprints on the walls, and the loud music, a folletti toasting a marshmellow over a small bonfire on her roof is just one step too far. Finally, there is author-illustrator Ben Hatke’s unique treatment of the subject matter. Those with kids who have been bitten by the Graphic Novel Bug (which may not be a new phenomenon, but which is gaining momentum like never before) may already know Hatke from his acclaimed Sci-Fi series, Zita the Spacegirl (Ages 8-14). Even I—not by nature a comics lover—have fallen in love with this sophisticated graphic novel trilogy for its spunky heroine, other-worldly setting, deeply cadenced narrative, and all-around cool factor. With Julia’s House for Lost Creatures, Hatke’s first foray into the picture book world (and the beginning of more to come! ), he blends both traditional picture book elements with comic-strip attributes. Playing to his strengths as a graphic artist, Hatke is able to advance Julia’s story as much through the visual spreads and frames as he does through the carefully-chosen sentences. The resulting hybrid feels almost like a new literary category, and both of my children Can’t. Get. Enough. 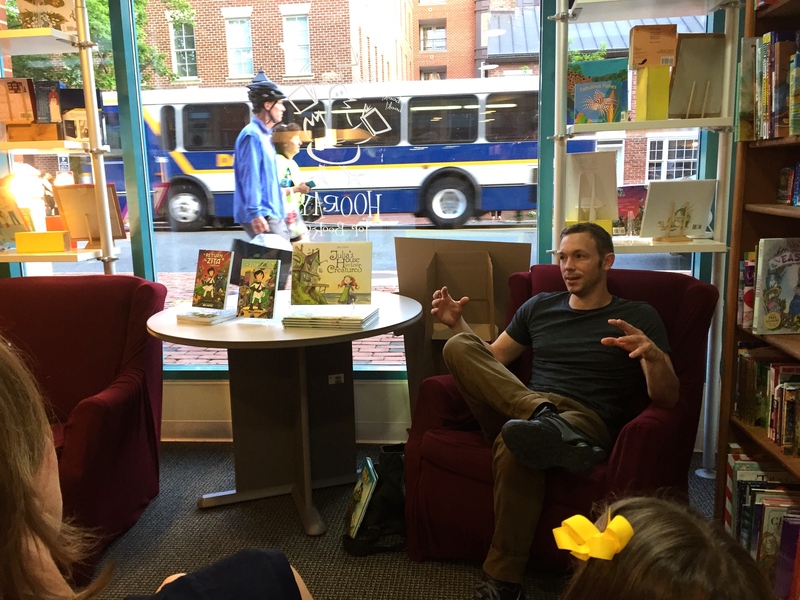 When I learned that Ben Hatke would be leaving his rural Virginia home (nestled in the Shenandoah Valley with his wife, four young daughters, and an eccentric cast of cats and chickens) to visit Hooray for Books here in Alexandria, you can bet we were going to be there. Hatke is exactly the kind of literary artist that I would like my children to know: approachable, vastly talented, and bursting with pleasure to be doing exactly what he is doing. 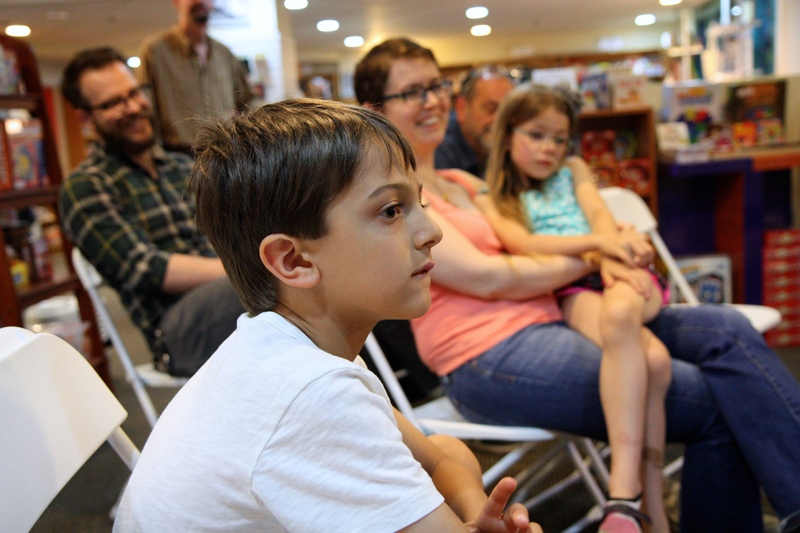 His enthusiasm for book making—specifically for experimenting with the comic format—is positively contagious. 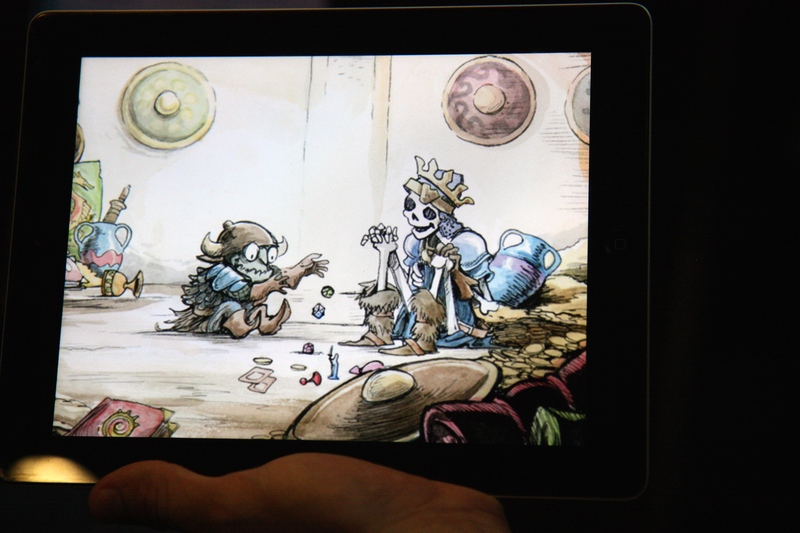 Speaking of projects, here is a glimpse of Hatke’s next picture book, starring a misunderstood goblin and his skeleton friend, destined to live in that same compelling cross-section of fantasy and realism that is very quickly becoming Hatke’s claim to fame. And even before the goblin book comes out, as early as this September, we’re going to get an early-reader graphic novel, somewhere between the levels of Julia and Zita, titled Little Robot. That’s right, people, this guy is on a roll. Or perhaps I’ll leave the hosting to local bookstores. There’s no better time than the fall for reading spooky stories! Now, before you start worrying, let me preface by saying that my almost five year old is the ultimate Nervous Nelly; so, if he’s not scared by these stories (and actually demands to read them again and again), rest assured that your kids won’t be either. In fact, if you have a child that’s scared of the dark, even better: books like these can be an invaluable tool for empathizing with kids about their own nervousness (and helping them understand the role their imagination plays). Without further ado, I give you my favorite new spooky story of the fall: Creepy Carrots! (Ages 4-7), by Aaron Reynolds, with illustrations by Peter Brown. I have loved everything Peter Brown has ever done, beginning with his first book, Flight of the Dodo, which is a quirky story about bird poop (remember: my son has a thing for poop books). What impresses me most about Brown is that none of his books feel derivative: for each story, he perfectly tailors his illustrative style to the topic at hand. In Creepy Carrots!, he sets his witty, cartoon-like drawings against a backdrop reminiscent of film noir, invoking a Hitchcockian play of black and white frames accented by splashes of orange. The splashes of orange are, of course, carrots—namely, the carrots that a paranoid Jasper Rabbit believes are following him. Jasper has a “passion for carrots,” especially the fat, crispy carrots he pulls out of Crackenhopper Field; unfortunately, his also thinks he hears the “tunktunktunk” of them creeping up on him at all hours of the day and night. What follows is a hilarious tale of Mistaken Identities. There are few things kids find funnier than a character misinterpreting something that they themselves can easily identify. “‘Mom! Mom!’ Jasper screamed. ‘Creepy carrots! In the shed!’ He opened the door slowly. There weren’t any carrots. Not even the regular kind.” (Instead, there are three orange-handled tools.) The Mistaken Identities snowball as the story progresses (orange flowers, orange soda cans, even orange curtains all look like creepy carrots to Jasper), until at last Jasper decides to stop the madness: he will construct the largest fence around Crackenhopper Field (complete with an alligator-filled moat) to ensure no carrot will ever stalk him again. The mark of a superbly crafted spooky story is when the main character possesses the scrappy-ness to face his fear head on. Jasper empowers our little ones to call bluff on their own overactive imaginations, reassuring them that there’s no such thing as creepy carrots (oh, and if there were, there’s an easy solution for getting rid of them!). So, dim the lights, grab the flashlight, ready your deepest “tunktunktunk” voice, and give your kids some spookiness of the silliest sort. You are currently browsing entries tagged with skeletons and ghosts in children’s stories at What to Read to Your Kids.